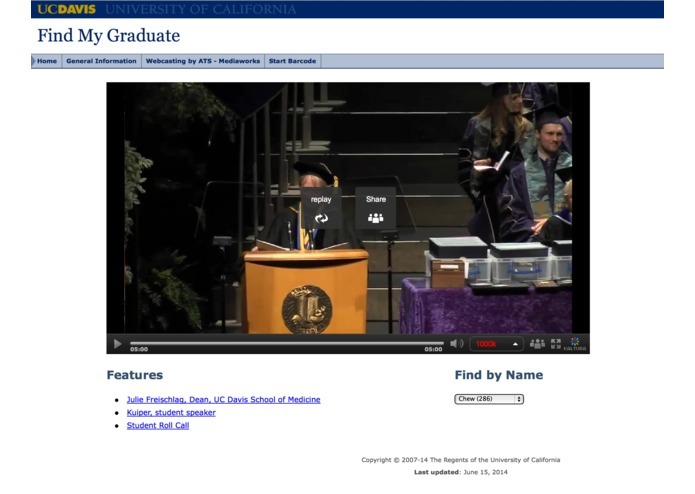 Find My Graduate: watch the keynotes or just the exact moment when your graduate receives his/her diploma. Every year approximately 3.5 million students graduate with some type of college degree in the U.S. alone. Many of them attend lengthy graduation ceremonies with thousands of their peers. At the University of California, Davis, for example, we annually graduate between 5 and 10 thousand students across 12 colleges and professional schools. Most ceremonies are held in our largest indoor stadium. All of these ceremonies are streamed live and later on-demand by the campus' Media Services group. Even when physically present, but certainly when watching the live or on-demand video, it is easy to miss those you care most about. For several years we have been thinking about how to efficiently provide parents, family, and friends, with a reliable way to find the exact moment when the person they care about is announced by name, crosses the stage, and receives their diploma. In the case of UC Davis, and potentially many other schools, the solution lies in printed name cards carried by every student. These cards are read by professional "readers", often containing added phonetic information to help with pronunciation. Our design involves the use of a unique QR code for each student, printed on the back of their name card. The QR code will be scanned just before the student's name is announced. The exact time code and identify of the student are transmitted to a central server where they are later synced up with the on-demand video of the ceremony. 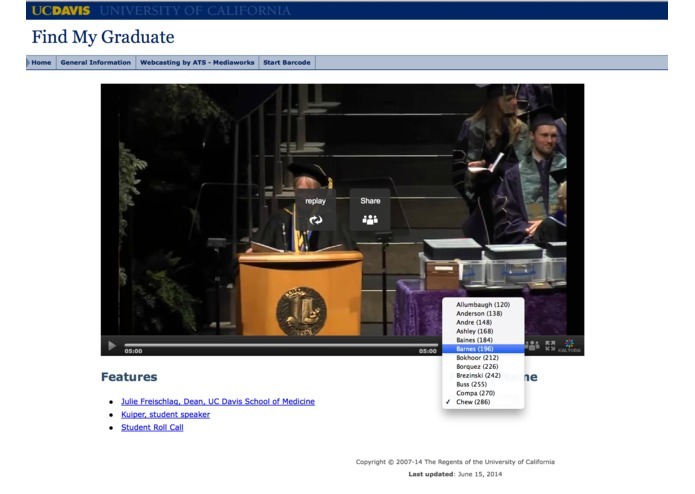 For the competition, we also integrated the technology of VoiceBase to obtain transcripts of the ceremony. Those portions of the transcript that apply to keynote speakers are separately identified and linked to the appropriate presentation. We have found these transcripts of full-length speeches to be quite good even in their machine-generated form. However, a long series of diverse and unique names, as one finds during the diploma award process, presents a more challenging situation for any automated system. Our application clearly demonstrates the synergy that can be realized by combining an automated transcription system with a QR code based encoding. Finally, we are grateful for the participation of Rackspace in this competition. Last minute VPN issues arising between hotels and our university servers prompted us to try out Rackspace's Cloud Servers. With relative ease, a server was instantiated and configured. Our final submission URL below is the result. All back end server software for the competition was written in python, combining the Kaltura and VoiceBase APIs with a SQLAlchemy and the postgresql database. The client is based on the Kaltura player toolkit and JQuery. 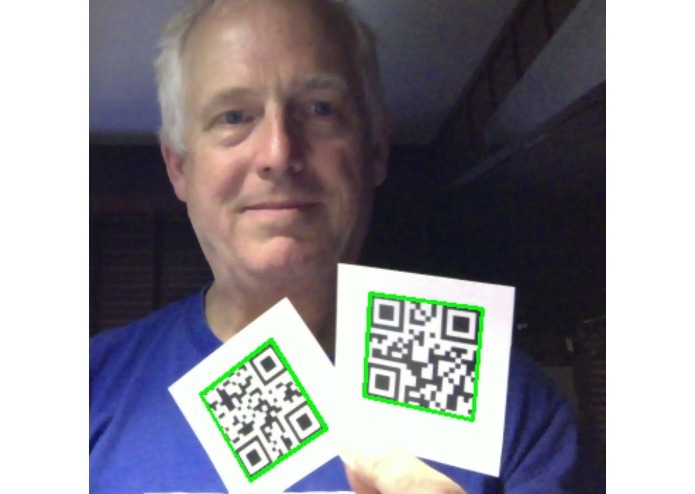 We used OpenCV and Zbar to generate and scan the QR codes.